Recent events at my institution have triggered some memories, which in turn triggered reflection about governance issues at academic institutions. Let me start with the memories, a next post will deal with the current issues, and I’ll end with a brief reflection. In the mid 1990’s, I witnessed a situation with a research assistant (let’s call her X) at one of the smaller universities in Flanders (Belgium). Her position was in an institute that had been founded a few years previously as a merger of two existing departments. The new-founded institute was given the target of being financially self-sufficient after a three-year period. If that target could not be reached, the university management would cut staff levels within the constituant department with the lowest financial gain in the last three years. Anyway, at the moment of reckoning, X’s department – which had done very well previously and had brought the largest dowry into the merger – had been slightly less successful in the previous three years than its counterpart – which had secured a large telecom contract – and so her department had to cut down on staff. This situation was perceived as very unjust, and the members of X’s department started an internal protest and asked the university management to consider different mid-term and long-term achievements and criteria, but the management team refused to budge. Which is why her department – as a whole – decided to write a letter to the board of gouvernors, on behalf of the whole team, thereby bypassing the university management. As one of the more vocal and more verbally adept members of the department, she was asked to write and sign the letter on behalf of the whole team. Of course, nobody spoke up. By voicing the colleagues’ grievances at their request, X had become the perfect scapegoat (Kent & Boatwright, 2018, Sarkar, 2009). Two months later, her contract at the university was cancelled. Three other colleagues were transferred to different departments, but were able to stay at the university. X left the university with a very bitter feeling of betrayal. Dealing with diverging perspectives and dissent? Within all Flemish (Belgian) universities, there is a form of employee representation, formalised as a council in which the official Belgian trade unions are represented, according to the results of employee elections (which are held every 4 years). This council (Ondernemingsraad) is a forum in which a limited set of topics can be discussed, mainly related to HR issues at a collective level (well-being, benefits, etc.). In Dutch universities the influence of student and staff representatives within the official representation is much more elaborate (thanks to extensive laws in that respect), and the topics that have to be discussed with students and staff include major issues such as strategy, finance, quality, but also HR issues at a collective level. On the surface, this form of institutionalised representation (VSNU, s.d.) should prevent situations such as the one described above, in that it offers a channel for dealing with diverging perspectives or dissent amongst staff or students. The reality is less straightforward, as I know from personal experience. Between 2010 and 2017, I have served as the chairman of the employee council (ondernemingsraad) and the joint representation council (Gezamenlijke vergadering) at my university, and have encountered situations which were inherently similar to the one described above, though in a more formalised context. The purpose of these representation councils is to provide an official channel for diverging prespectives, and in certain specific cases the university management needs formal council agreement (instemmingsrecht) before it can make a final decision, but in most cases the councils’ influence is limited to an advisory role (adviesrecht). One would think that these councils provide an opportunity for management to get a feel for staff or student perspectives, and that management would use this opportunity in order to create support for their policies and decisions. In my experience with different constellations in the university management board during my 7-year tenure as chair, managers tend to ignore or at least minimise the input from the councils when opinions and perspectives diverge. (d) are the usual bunch of negativists and moaners. This inability to deal with divergent opinions within a university – a professional organisation that prides itself on critical thinking, autonomy and independence – appears counterintuitive and contradictory. The next blogpost will investigate this contradiction in more depth. Just finished participating in the weekly #CMALTcMOOC hangout with Thom, Todd and Ian, and decided to put out a ‘quick and dirty’ blogpost about one operational issue that I encountered this week. Our institution uses its own VLE – yOUlearn – which is based on the Liferay platform, and which is continuously being designed and developed in-house. Last weekend, the system was updated and Monday morning a new version was available. Because it was the first Monday of the month, I needed to update the list of available thesis positions for our Master students. And somehow, during the updating of the page, the named links at the top of the page would disappear, time and time again, whereas they worked fine just 10 minutes before. So I reported my experience – via e-mail – to my colleagues, the learning techs collaborating with the software developers, and suggested that it may be a bug from last weekends’ update. After about an hour of e-mail back-and-forth, we sat together at a PC, and I was able to demonstrate that I wasn’t just ‘imagining things’ or that I ‘must have made a mistake’. It turned out that an HTML-cleanup module was triggered for users with the ‘teacher’ and ‘author’ roles, and this was only supposed to trigger for users with a ‘student’ role, to prevent the addition of scripts and potentially malicious code. Through the years, colleagues have learned that I am pretty good with technology, and that makes the (learning) tech people more willing to take my experience seriously. Personal experience and reputation seem to play a role in this type of encounter. In Dave O. White’s terminology: the colleagues at the OUNL consider me as an experienced ‘digital resident’ as far as our institutional learning technology is concerned, and accordingly seem to take my input more seriously. The culture within the VLE development group is its own sub-culture. Their focus is on the reliability, robustness and scalability of the technology that they are developing, and not so much on the usability or functionality from a user perspective, or on the teaching and learning aspects. In my discussions with the development team, I keep bringing up the importance of having end-users (both students and teachers) closely and continuously involved in the development, but that concept seems to be so difficult – maybe even threatening – that user involvement is still very limited. Referring to Amber Thomas’ ALTC keynote (below), I think it is important to have individuals translate between learners, teachers, learning technologists and ICT-people. I often take the role of the ‘Tech translator’, and very much enjoy it. This is my first WordPress blogpost. The messages you find below, are imported from my old Blogger site. As you may read below, I have at different occasions tried to start (and keep on) blogging, but somehow my character or attitude are not compatible with blogging. Yet here I am, trying once again. Now the purpose is to build a portfolio in order to achieve the CMALT accreditation, offered by the Association of Learning Technology. In memoriam Erik Duval: TEL Rockstar or TEL-evangelist? 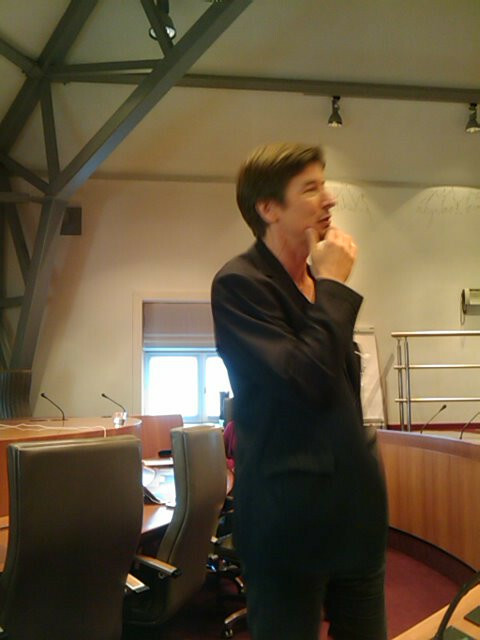 This is a picture of the late Erik Duval talking about “Open learning in practice” on October 24, 2011 during the VLHORA Studiedag “The Educational Highway” at the Flemish Parliament. It was an interesting programme that day, with keynotes by Steven van Bellegem, and Stephen Downes, and parallel workshop sessions with most of Flanders’ experts in the field of technology-enhanced learning: Pedro de Bruyckere, Cindy de Smet, Jan Elen, Jos Dumortier, Jan Seurinck, and of course Erik Duval. The picture illlustrates Erik’s typical presentation style: one hand in his pocket, relaxed, eyes sparkling, with a semi-smirk on his face, semi-improvising his way through his never-ending stream of mostly graphical slides. Typical for Erik was that he would be sitting in the audience until 10 minutes before his speech or keynote, refining his presentation, or linking his thoughts to issues mentioned by the speakers before him. An avid Apple-fan, he had a huge collection of slides in Keynote, from which he made a selection on-the-fly to fit the audience, the theme or some recent topic. Also, he didn’t rely on his slides, like so many others. The slides would most often illustrate the story that he told, and if the presentation technology failed, Erik would still keep you chained to your chair with his intense, and often somewhat controversial style of storytelling. In the flood of social media reactions on Twitter and Facebook that was triggered by his untimely passing on March 12th, some people have called him a Science Rockstar, or even the Steve Jobs of Flemish higher education. Of course, some of his talks were controversial or provocative, but that was mainly to start people thinking and get them to reconsider pre-conceived ideas, or look at an issue from a different perspective. But he was no rockstar in the sense of aloofness, prima-donna-ism or inflated ego. Erik was as down-to-earth an academic as you may ever encounter, always stressing the work of others, usually downplaying his own contribution, and friendly to a fault. He was a Steve Jobs in the sense that he was very influential, innovative and that he passed away much too soon, but the comparison stops there. Erik was first and foremost a family man, firmly rooted in Antwerp, who preferred video-conferencing and skyping above travelling and plane hopping. He was also open and generous with his knowledge, insights and ideas, and not just trying to monetize them. He was the ultimate educator when guiding and supporting his students, PhD researchers and colleagues. His research group often had the highest number of PhD students within the department or even the faculty, mostly due to Erik’s network and ideas. When talking with Erik, he would give you his full attention, even though he always seemed to be in a hurry. Was he a TEL-evangelist, as the title of this post suggests? Definitely not in the sense of someone trying to convince you about his viewpoints at all costs. He didn’t just talk the talk, he applied his ideas in his own work with his students and colleagues, and led by example. Erik and I have been colleagues for more than 10 years, first at KULeuven, in projects such as Pubelo or on the advisory committee for the KULeuven VLE. Later we kept in touch through conferences, workshops, PhD defenses and of course online. I remember a semester where Erik invited some close members of his international network to join his HCI students through Facebook to allow them to test Facebook apps that the students were developing. Last time we had dinner together was at Bozart in Brussels some years ago, when I had arranged a meeting of a number of Flemish TEL-experts, together with Stephen Downes who was visiting for a keynote. When Stephen came down with the flu, the rest of our group went to dinner anyway, and enjoyed a lovely meal and lively conversation. Erik will be missed in our international family of researchers and practitioners of technology-enhanced learning, but his ideas, his enthousiasm and soul will stay with us for a long time to come. Author sverjansPosted on March 17, 2016 September 25, 2018 Categories UncategorizedTags Erik Duval, in memoriam, K.U.Leuven4 Comments on In memoriam Erik Duval: TEL Rockstar or TEL-evangelist? It seems like I never take the time to reflect and work on my own professional development. There’s always so much stuff that needs to be done, with a higher priority – but often with less importance, if you think of it. So – by way of penance – I decided to join the 2nd run of the open course on Technology-enhanced Learning (#ocTEL), after hearing so much positive feedback at last year’s ALT Conference (#altc2013). What’s my main goal in attending ocTEL this year? What do I want to achieve? Well, you could call it industrial espionage. Together with Wilfred Rubens (@wrubens), I will be developing a MOOC on blended learning at the Welten Institute of the Open University in the Netherlands. I want to learn which tools we could use in our MOOC, and see how we can connect those to our main site (a Liferay-based learning environment). Moreover, I want to test whether I can use my attendance in the course as credit for our internal professional development requirements, and whether it would be useful to direct my colleagues to next year’s ocTEL. ocTEL is not my first MOOC, so I kind of know what to expect in terms of overwhelming experiences, getting lost, and finding interesting people to network with. So I have attended the first webinar, and based on that, I have started a Scoop.it topic, that I am hoping to populate together with co-curators from the ocTEL course. The digital scholar – which way to go? Within the context of the Massive Open Online Course (MOOC) #change11, week 3 dealt with different aspects of digital scholarship. This week’s discussion was based on the new book by Martin Weller called: The Digital Scholar. I participated in a webinar with Martin on Wednesday, and heard him present a strong case for the potential impact of digital technologies on professional scholarship. Now I have been following Martin’s contributions in this discussion for some time now (I have referred to his work in my workshop about social media for PhD students, and will be interviewing him later for an internal workshop at Open Universiteit), so I kinda knew his story. I find that what I’m missing from his story, is a perspective for individual teachers and institutions on how this digital scholar will look in practice. Is it enough to use social bookmarking or to share your conference presentations, or is that a start that will inevitably lead to more? Are you only a ‘real’ digital scholar if you refuse to publish in closed journals and only opt for open access journals? How to deal with publishing your publically-funded research results? Do I need to be a rebel within my institution, and how does it effect my own career? Or can I act as an evangelist and try to convince people that the end of the world as we know it is near? I am convinced that the digital scholar is the scholar of the future, but I guess what I’m looking for is some guidelines on how to achieve a gradual, yet speedy innovation within our institutions that will lead to a point in the near future where we look back upon 2011, and wonder where the change actually happened. Can we formulate a path of inevitability that will sneak up on our decision makers and allow us to gradually become digital scholars, or do we need a shock therapy to achieve this? And – by the way – I made a first downloadable ebook version of Martin’s book. The internal links in the document are not all functioning perfectly, but you can download the book as is (also on non-Kindle readers) and enjoy reading it offline too. I’ve made pdf, ePub and mobi versions available on Dropbox, made with the help of the calibre tool. Author sverjansPosted on September 30, 2011 Categories UncategorizedTags change11, digital scholarship, mweller3 Comments on The digital scholar – which way to go?